Looking after your garden requires multiple things, from your ornaments, ponds, flowers, Garden Benches and more. Keeping on top of everything become expensive. If your budget is a little tight and you’re wondering how you can spruce your garden up a little, consider upcycling your garden bench. Upcycling is known for helping crafty people add splashes of vibrant colour to their life. Customers are quite often restricted to the colours they can choose from in the shops; grab the craziest and most popping colour you can for your bench for a one-of-a-kind piece. Upcycling your bench doesn’t have to stop at painting it a fun colour. Once the paint has dried, take time to draw or paint on some handcrafted designs. If you’re not very good with a paintbrush, buy a stencil or transfer for your bench. Allow your handiwork to dry fully before applying a top coat or varnish. Your new bench will look great on its own, but for a special touch, add some accessories. If the weather is good, a few comfortable cushions are nice. If your upcycling project was a success and you enjoyed it, get cracking on upcycling a table to match your new bench. You’ll have somewhere to sit and have afternoon tea at. How lush! Experts at upcycling have started to get one product and turn it into something else. This is a great way to make a new bench without spending much money. One idea would be to take old chairs and attach them to make a bench. You can also make garden benches out of old tables. Think outside the box for a very unique upcycled garden bench. So many of us love quotes on our accessories, as tattoos, and so forth. Benches have always been well known for dedicating to a loved one. Writing a quote or dedication on your bench is a very personal way to customise your upcycled bench. The most exciting part about upcycling is that there is no right or wrong way of doing it. As long as the pre and post garden bench care is carried out properly, the middle parts are up to you! Have a look through garden bench websites, go to the park, look at different colours and let your creative side help you design a special garden bench. Whichever pattern, materials or colour you choose for your garden bench upcycling project, as long as you treat it as you would any other garden bench, you’ll have a piece of equipment that is sure to look great and will add the wow factor to your garden. Search social media sites for projects similar to yours for tips and style inspiration. Think about your style and how you could incorporate that into your garden bench. Mix and match colours and patterns for added quirkiness. 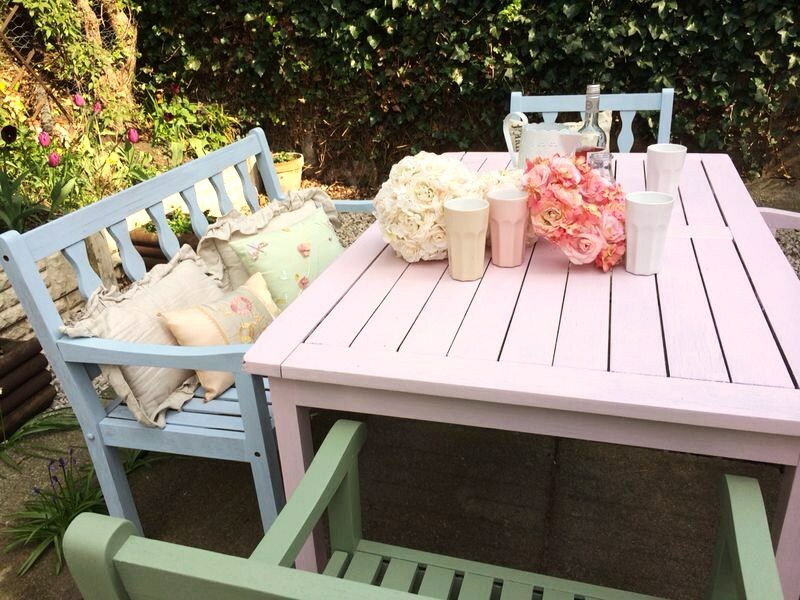 Head to charity shops for garden accessories to accompany your new bench. Give the rest of your garden a lift with some new plants and flowers - looking out onto them as you’re sat on your new bench will lift your spirits and make the work you’ve put in worthwhile. Consider building or buying a shelter for your bench so that you have somewhere to sit, whatever the weather. Ask local scrap yards if they sell or give away any materials that could help you build different sections of your bench. Ask friends and family if they have any paint left over from decorating to save you money - leftover paint usually ends up in the bin, so they’ll probably be willing to have it taken off their hands. Upcycle a bench for your little ones in the same way you’d upcycle an adult bench. Let them paint faces and/or patterns on their bench so they have a special spot of their own in the garden.